If you follow me on Instagram, then you will know I have been pretty obsessed with Bravura London for the past couple of months. The 2% Salicylic Acid Peel was my most used product in November and now with the addition of the 10% Glycolic Acid Peel and the Revitalising Ginseng Toner, my obsession is off the charts. It was so easy for me to pick them as last month’s favourites because I have used them more than any other product I own and have seen better results than with anything else I use. I have also been getting so many questions about them that I thought it was high time I did a review so you can get an idea of what they’re like and decide which one is right for you. This was the first product I ever tried from the brand and I instantly fell in love. I was having a few travel related breakouts and while having a nose around my cousin’s vanity, I spied this beautiful bottle and had to have it. I tried it that night and the next morning I was so impressed with the results. My skin was incredibly soft and smooth and the tiny bumps I had around my chin were gone! Salicylic Acid is incredible for purifying the pores and because this peel is 2%, it does that quickly and effectively. I call this “clear skin in a bottle” because that’s just what it is. It will heal existing blemishes and help prevent new ones forming. I love this as a maintenance product to continually keep my pores clear and that’s exactly what it has done for me. Since using this I have had no “real” blemishes at all. Through travelling, periods, not always eating well (indulging in sugar, dairy and red meat – all acne triggers for me) or sleeping enough, my skin has remained clear, calm and balanced, which I have never had before when on the road. I did a full review on this in October, which you can read here with all the details, so I will just say that if you suffer from frequent breakouts or have acne, you need this. Distilled Water, Lavender Water, Glycolic Acid, Glycerin, Sodium Citrate, Sodium Hydroxide, Hydroxyethyl Cellulose. Even before I tried the Salicylic Acid Peel I had been wanting to step up my glycolic strength to 10% so I was so thankful when Amanda (Bravura London creator) very kindly sent this to me to try. I had mixed feelings going in to it because I had never used any acid at 10% before and I was worried that it would be too harsh for my sensitive skin, but I also doubted if it would actually even do anything for me since the 2% Salicylic Acid Peel had given me such great results already. The first night I tried it, I applied a thin layer all over my face after cleansing and then toning with the Revitalising Ginseng Toner. There was a slight tingle (no burning) that went away after a few seconds and no redness or irritation. I washed it off after half hour and and then continued with my routine as normal. The next day, just like with the Salicylic Acid Peel, I was SO impressed. My skin was even smoother than before and looked bright and clear. I found that on top of being excellent for acne and enlarged pores, glycolic acid is amazing if you suffer from hyperpigmentation, sun damage or discoloration. It will gently exfoliate to reveal renewed, clear, even skin. Also, this peel is quite different to the salicylic acid one as it has more of a watery texture (no oil) and is infused with lavender, making it very calming and soothing. Not only that, it contains glycerin, which is a humectant and works to attract moisture. With this, there should be no peeling or dryness, so if you have dry/dehydrated acne prone skin, this is a great option for you. Amanda recommends using this 3-4 times a week and I agree. Anything more may be quite harsh and I think it works excellent in tandem with the Salicylic Acid Peel. I alternate them every other night and I love the results I get from this method. I have used this as a toner, serum and peel and all three ways work very well which means I can tailor how I use it to my skin’s needs. I have not tried this peel as I am quite allergic to lactic acid (Good Genes made my skin red and itchy and gave me three massive blemishes within 5 minutes of applying it) so I have enlisted the help of the lovely Swapna from Beauty Motormouth to tell you all about this one as she has been using it for the past few months and has seen great results. This 10% lactic acid peel is exactly what the skin needs to truly glow. It’s great as a pre-party prep on a Friday night or as a mid-week skin pamper. As it has a bigger molecule than the glycolic acid, it is a mild exfoliant that will gently slough away dead skin. Lactic acid acts as a humectant so it plumps the skin and the effect is clearly visible the next morning. This peel has been infused with rose water making it quite a treat and the texture is watery (like the Glycolic Acid Peel) so it is easy to work with. The pH of this product is such that it doesn’t cause any stinging and definitely no burning. I feel that the ease of application means it can be seamlessly incorporated into any evening routine. All I do is cleanse the skin, use a pre-peel toner like the Revitalising Ginseng Toner and just apply this peel for 10-15 mins and then wash it off. I use this specifically on days when my skin feels a bit lacklustre, usually on a Wednesday or Sunday when I want my skin to reset itself and be rejuvenated. I also use it when I know that I have to deal with the pigmentation scars. I feel like ever since I started using the peels, my skin seems more adept at absorbing the products I apply on top . The texture works quite well with my moisturiser as it doesn’t feel tacky on my skin, it absorbs quickly and I don’t need to use a lot to see results. I tend to use this peel in my evening routine and prefer to keep it on my skin for 20 mins and then wash it off and proceed with my usual routine. A little goes a long way and it is quite a brilliant skincare investment. Ingredients: Purified Water, Aloe Vera, Witch Hazel, Horse Chestnut Extracts, Glycolic Acid and Ammonium Glycolate, Glycerin, Glucose, Fructose, Sucrose, Urea, Dextrin, Alanine, Glutamic Acid, Hexyl Nicotinate, Ginseng Extract, Phenoxyethanol, Sodium Benzoate, Biotin, Polysorbate 20, Fragrant Oil. Active Ingredients: Glycolic Acid 5%, partially neutralised by Ammonium Hydroxide. This we need to talk about – more than just a Glow Tonic dupe, it is the superior of the two. No dyes (it is now clear), no unlisted ingredients and most importantly after reading this, no more plastic bottle. I was so happy when Amanda sent me the new packaging to debut because it is so beautiful. Fitting in perfectly with the frosted glass bottles that the peels come in, it is now more environmentally friendly, as well as being a brilliant product. It is so important to use an acid toner after cleansing to rebalance the skin’s pH levels and prevent any bacteria forming which could lead to possible acne development. Not only that, I find that after using this, whatever I apply on top absorbs quicker and layers better. This is also great to use before the peels as a skin pH adjuster and by doing this the peels are at their most effective. As this is only 5% it can be used every day, both day and night and without causing any irritation (unless you have very sensitive skin). Overall these peels are skin game changers. They are incredible value for money and give excellent results. They are so versatile and can be used in a number of ways – as a toner, peel or serum; alone or together. You can also add any of them to a clay mask or cleanser to create an exfoliation element to the product. To all my green beauty lovers out there: this is the product to make an exception for. These peels will make all the difference to your skin so it is worth including them as your one non-green beauty item because the results are just that good. I can’t recommend these enough and because I love them so much I just had to team up with Amanda and do a giveaway! Head over to my Instagram now for a chance to win a peel of choice! Good luck! P.S. 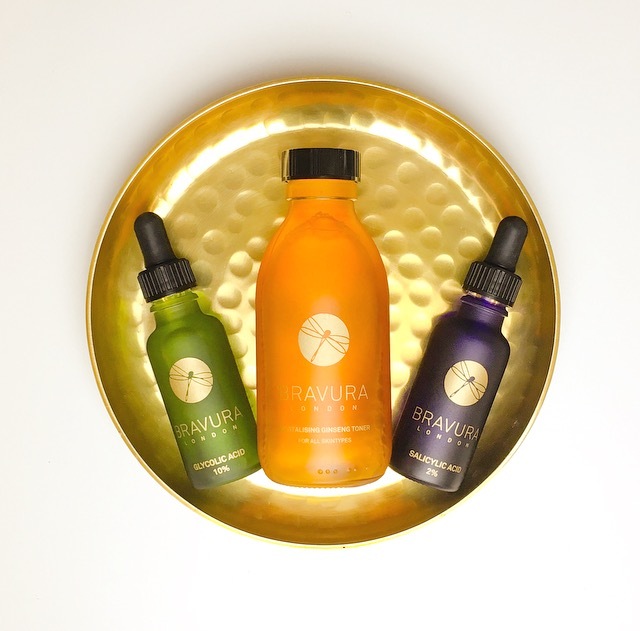 – The Bravura London website and Amanda’s blog have a lot of excellent information (including videos) about all these products, so if you still have any questions, check them out or feel free to ask either one of us on Instagram. That tonic has my name on it! Thank you very much for posting this giveaway!